Dove Creek began its public life as a radio broadcast on KRFP 98.5 fm in Moscow, Idaho. The producer, a woman with whom I had attended graduate school, approached me in July of 2007 after a reading of my first collection of short stories, Summer of Government Cheese, to ask me if I had anything of novel length. She had an idea about publishing an entire novel on the radio. For years she had produced a weekly show called, “Words and Music,” during which she read excerpts from famous and not-so-famous writers’ work, and she wanted to produce something new and different. Nancy laughs now to hear herself called a radio producer, since KRFP is a small, low-wattage, independent radio station run on donations and all volunteers, but I was privately thrilled. I had long ago placed Dove Creek in the very back of my closet and kept trying to make it stay at the back of my mind and imagination. 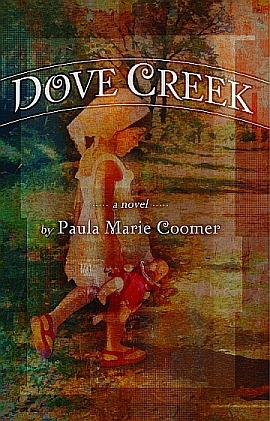 I had already drafted another novel, and Dove Creek, which was based on a very difficult but enlightening period of my life, was going the way of any novel that has been rejected 46 times–the wastebasket. But, she bid me dig it out, and so I did. We didn’t get very far into the recording of the broadcast before it was clear I had major revision work in front of me. The rewrite took a year. Then the recording took a year, but eventually we finally had a finished, serialized novel recorded for broadcast. The airing took 14 weeks in two 20 minute time slots per week. The radio station subsequently made the broadcast available for mp3 download on their website. A little more than 4 years later, nearly 7000 episodes have been downloaded. You can listen or download it yourself for free at http://audio.krfp.org/dovecreek.html.